Are Social Media Sites Doing Enough To Combat Rumors And False News? As they struggle with disasters and other crises, police, fire and other public officials are spending an increasing amount of time and resources knocking down rumors spreading on social media. Sonoma County Sheriff Rob Giordano updates the media on evacuation and search-and-rescue efforts on Oct. 11, as wildfires devastate the county. At a more recent news conference, Giordano struck down wildfire-related rumors circulating on social media. "I want to talk about something, there's a little rumor control issue," Giordano said during a news briefing updating the media and area residents on fire fighting efforts, evacuation orders and other urgent matters. Giordano explained that a couple of days earlier, his officers had arrested a homeless man for starting a small fire to keep warm in a local park where he was known to sleep. "There's a story out there that he's the arsonist for these fires," Giordano said. "That is not the case. There's no indication he is related to these fires at all." The erroneous story came from Breitbart News, the right-wing website run by President Trump's former political strategist Steve Bannon. It reported that an undocumented immigrant had been: "arrested for suspicion of arson in Wine Country fires that have killed at least 40 residents." That, Sheriff Giordano said, simply was not true. "I just want to kill that speculation right now so we didn't have things running too far out of control." After this story was shot down by the sheriff and was debunked by Politifact Factcheck.org, and Snopes, Breitbart eventually added a clarification. But the damage had been done — the original story had spun out of control. One version was shared nearly 60,000 times on Facebook and a follow-up piece with the same false narrative was shared 75,000 times. That does not include the number of times the story was tweeted out or shared through other social media platforms, nor does it include how often it was picked up and pushed out by other right wing sites, including Drudge Report and InfoWars. This is an example of how false information is being spread through the big social media platforms and it raises questions about whether companies such as Facebook and Twitter are doing enough to stop it. 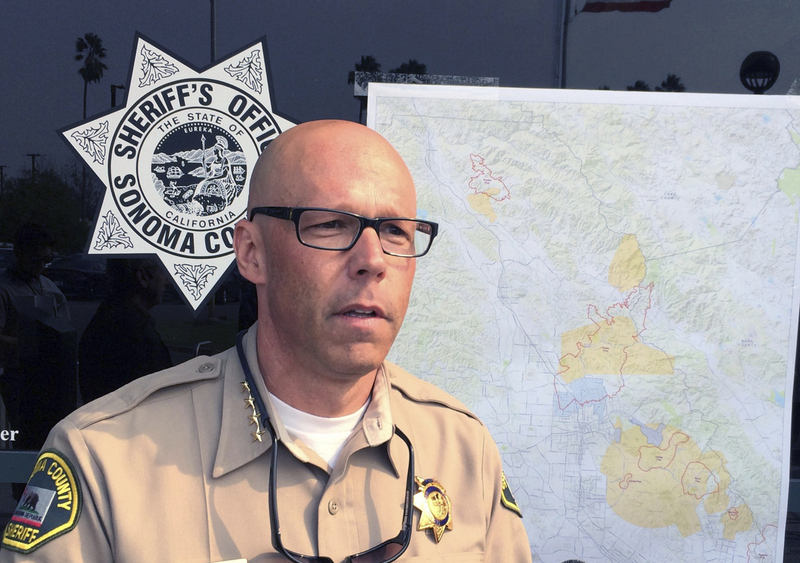 Because even as the wild fires still raged, the false stories ignited a squabble between the Sonoma County Sheriff and Trump Administration, as the acting director of Immigration and Customs Enforcement criticized the Sheriff's office as a "non-cooperative jurisdiction" that "left their community vulnerable to dangerous individuals." Giordano again had to set the record straight, calling the ICE director's comment "misleading, inaccurate, and inflammatory." This is not the only instance in recent weeks that law enforcement authorities have had to spend time and resources during a crisis trying to stop rumors and misinformation. In Houston after Hurricane Harvey, phony news photographs proliferated on social media supposedly showing the airport underwater and sharks swimming through flooded streets. 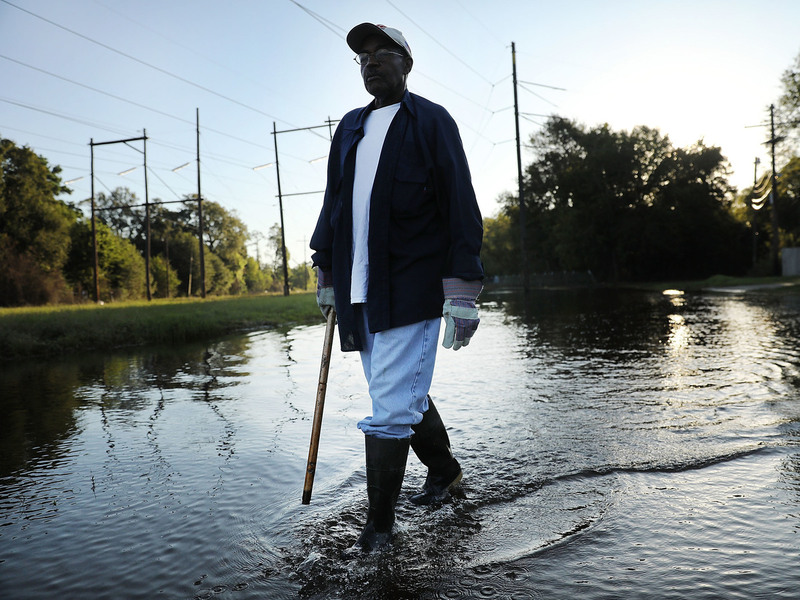 Authorities also had to quell false rumors that levees had burst and that a dam had failed. Paul Morris checks on neighbors homes in a flooded district of Orange as Texas slowly moves toward recovery from the devastation of Hurricane Harvey. After the Las Vegas massacre, officials angrily addressed virally-spreading conspiracy theories, including one about a second shooter. "There is no conspiracy," Clark County Sheriff Joe Lombardo said angrily in one briefing. "Nobody is attempting to hide anything in reference to this investigation." With the advent of social media allowing people to tweet out rumor as fact, or to deliberately spread false information to promote a political point of view, law enforcement officials across the country increasingly find themselves in need of truth squads. "We are hiring people to do just that," says Sheriff Sandra Hutchens of Orange County, Calif., and president of the Major County Sheriffs of America. "[People] that just communicate with the public and try and get that information out there... to counter a lot of the negative and in some cases false news that is out there." "It is resource intensive" at a time law enforcement budgets are tight, Hutchens says, but she adds it is a good thing for law enforcement to develop a strong social media presence of their own, to provide urgent information on developing situations and quell misinformation that could put residents in danger. She acknowledges, though, that some people continue to believe a false narrative even after hearing the facts. "You know, the political tempo is so high right now, I think that then people are just not listening to what the truth is," Hutchens says. To some degree, this is what the creators and disseminators of false content intend. They use automated systems to search for and push out misleading articles and misinformation reinforcing certain points of view, and then place them into people's social media feeds who read and share similar items. "So if we see something and it agrees with our assumptions, we are more likely to believe it and share it," says Indiana University journalism professor Elaine Monaghan. Monaghan says social media users need to become smarter consumers of news and look into the source and validity of information. "There's no question that when there's false information in a moment of crisis and danger, of course humans may respond in a way that puts them in even more danger," Monaghan says. "And that's where we really have a problem we need to confront. " But she also says all the responsibility does not fall just on the social media user. Facebook, Twitter and other social media platforms themselves need to do a better job policing misinformation. "So much news is being carried there, that it is incumbent on these organizations that are making money on news, to act responsibly in the dissemination of it," Monaghan says. It is likely that some members of Congress will ask that of Google, Facebook and Twitter, when executives from those tech companies appear at hearings on Capitol Hill this week.